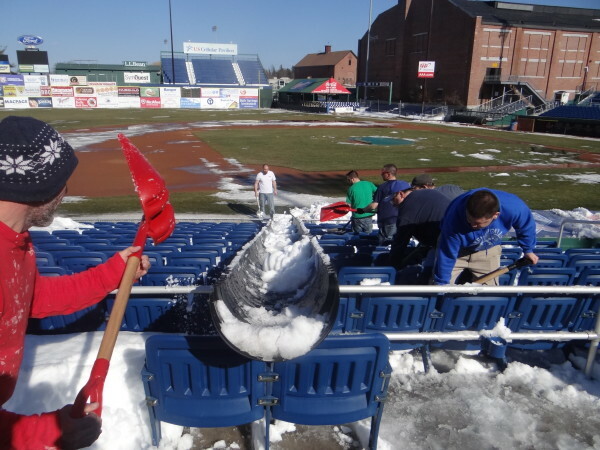 Workers shovel snow out of the grandstand in this recent photo at Hadlock Field in Portland. 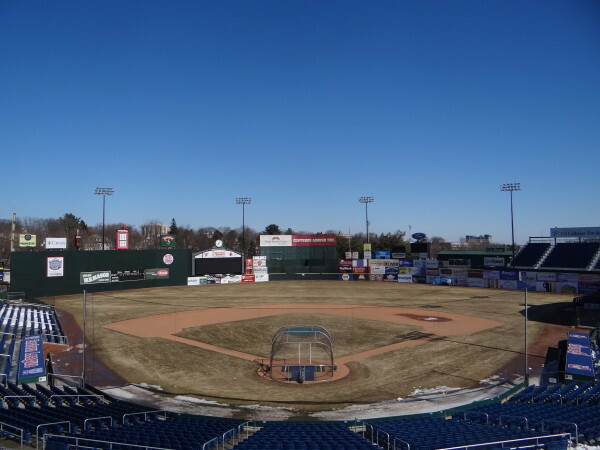 Hadlock Field in Portland, home of the Portland Sea Dogs, can be seen clear of snow in this recent photo after crews began removing it on March 1. The Sea Dogs' home opener is scheduled for April 9. The harsh, snowy winter won’t derail any plans for the Eastern League’s (AA) Portland Sea Dogs to open their baseball season against Reading on April 9 at Hadlock Field. Chris Cameron, the assistant general manager and public relations director for the Sea Dogs, said snow removal began on March 1, two weeks earlier than usual. Head groundskeeper Rick Anderson and his crew were able to clear the snow from the field and virtually all of the snow out of the stands. “For some reason, the prevailing wind dumped a lot more snow in the stands,” said Anderson, who has been the head groundskeeper throughout the Sea Dogs’ 22 years in Portland. Cameron said they used large PVC pipes cut in half as chutes and shoveled the snow into the pipes so it would slide onto the field for removal. Tractors and snow blowers then loaded the snow into a dump truck. Anderson said they had five workers on the field and 10-15 in the stands. It took nine or 10 days to remove all the snow and the field. Anderson said there is a minor concern about the frost in the ground. “The sun is higher [and warmer] now. Hopefully, Mother Nature will turn up the heat for us,” said Anderson. No matter what happens the rest of the way, Anderson said he expects the season opener to go off without a hitch. Cameron said the Sea Dogs are offering fans who buy a ticket to the season opener two tickets to a game at a later date if the opener is postponed. “We want to change the conversation and get people thinking about spring,” said Cameron. One of the highlights will be the annual Eastern League All-Star game on July 15. It was last held at Hadlock Field in 2005. The Sea Dogs will have their Throwback Thursday series with specific themes, and those will include Civil War Night featuring re-enactors. One will be dressed as Brewer-born Joshua Chamberlain, a college professor who became a Medal of Honor recipient as a Union Army officer at Gettysburg. The Dirigo Vintage Baseball Club will show the fans what baseball was like back in the 1860s. They also will have a 1980s throwback night featuring the “Back to the Future” Delorean and a “Ghostbusters” dress-up including the Stay Puft Marshmallow Man. The Sea Dogs have 16 home dates in July. Anderson thoroughly enjoys his gig as the groundskeeper at Hadlock. He said it’s interesting to see the players in the early stages of their careers on their way up to the major leagues. “You develop relationships with some of the players. Ninety-eight percent of the people in baseball are good people and that makes the job a lot easier. And it’s nice to see a lot of youngsters having fun while attending the games,” said Anderson.